Whether you are building your dream house, designing a new extension, adding roof windows to an existing extension, enhancing an existing room with a picture window, or simply tting new aluminium windows for their contemporary look, our made-to-measure systems can be designed to meet your specific requirements. Our aluminium windows are engineered for uncompromising performance and stunning aesthetics, but equally important are the options. As with all our products, you can choose from literally hundreds of colours in matt or gloss nishes, select one of the latest textured metallic nishes or even opt for one of our range of wood-grain effects. You can even have a different colour inside and out. Fitting a bespoke aluminium window system will not only keep your house looking good, it will keep repair work to an absolute minimum. Aluminium is a stable material. It isn’t prone to great expansion or contraction as the weather changes and it won’t suffer the warping problems common with windows manufactured from other materials. 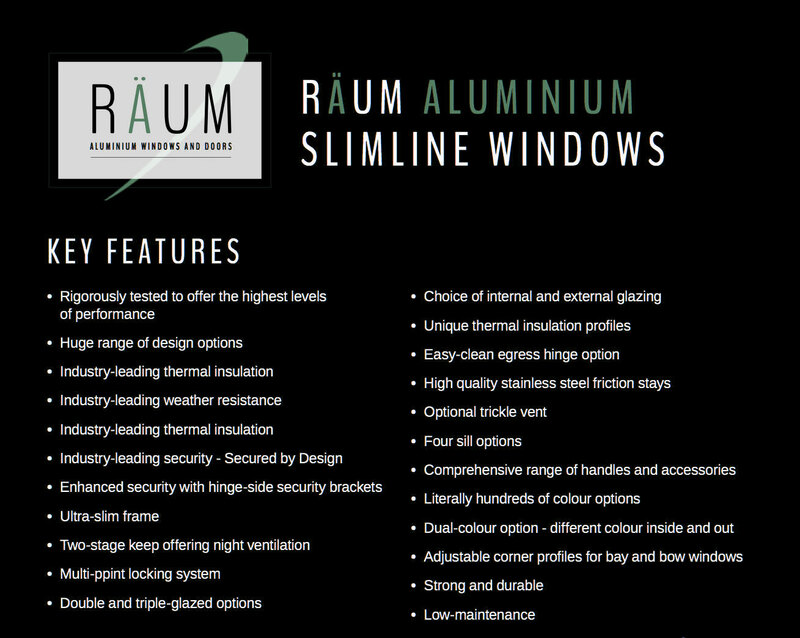 Whatever the weather, aluminium window systems will open and close as intended time and again. Our exclusively designed polyamide thermal break system and multi-chambered pro le enables us to achieve industry- leading thermal performance in all our panoramic windows. Combine this with high performance glazing and our windows will help keep your house cosy and warm. We can even supply a system that achieves the exceptionally demanding Passive House standard. Our windows are tted with a state-of-the-art multi-point locking system and our internal glazing bead on sash windows prevents the removal of the glass from the outside. Combined with some clever design, this means our aluminium window systems are amongst the most secure on the market, meeting and often exceeding the requirements for some stringent British and European security standards. A combination of multiple weather gaskets and a rebated frame pro le helps to keep out cold draughts. The multiple chambers in both the aluminium pro le and the thermal break further help keep the British weather outside.